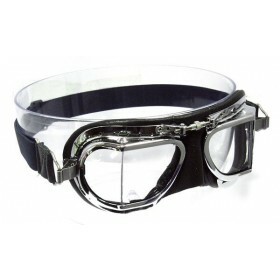 matte black powder coated frames, Black leather face mask, elasticated headband designed to fit under and over crash helmets and comes fitted with clear polycarbonate scratch resistant angled lenses. Leather Halcyon compact goggles were developed specifically for use with modern open face crash helmets. 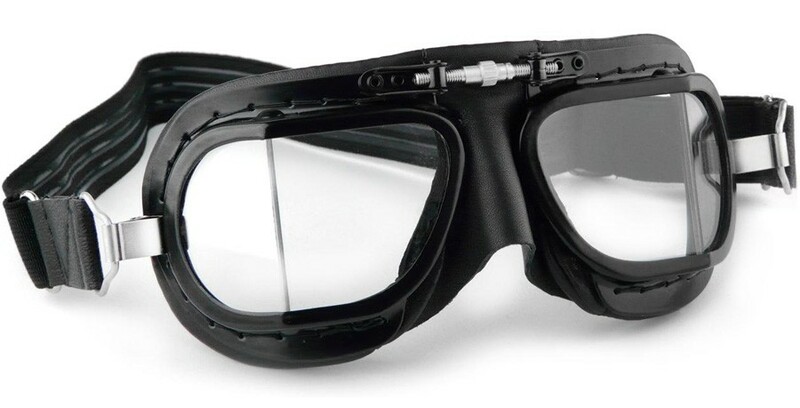 By significantly reducing the frame size and thickness of padding the goggle will now fit much more freely inside restricted spaces found with some of the new DOT certified helmets Made in England from solid brass frames which are powder coated black and hand stitched to a soft padded black face mask. 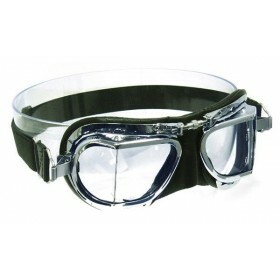 The compact goggles are the perfect choice for Classic motorcycle riders The head band now also comes fitted with triple silicon, elasticated non-slip strips for the perfect grip when worn over an open face crash helmet.